Ever since I became proficient enough at surfing to willingly risk my well being at it I’ve been cognizant of the extreme selfishness inherent in doing so. Which is not to say I don’t appreciate the attraction. My occasional hankering for risk has not dimmed with age, it has grown, as the dull responsibilities of adulthood have surreptitiously monopolized my days and older, more sedate thrills have come to feel mundane. And so I find myself occasionally pushed to ever more dangerous ends in search of the same sense of bliss that I once felt just playing in the shorebreak. I know what my family and loved ones would say, indeed have said, and its them I think about, invariably, when buried under 10 feet of whitewater, fighting the panic from my mind and hoping the next wave isn’t too far behind. The modern risk taker cannot have it both ways; cannot claim to love others more than he loves himself and the experiences he yearns for in the wilder expanses of nature. Ours are lonely pursuits, and the best are those for whom everything is secondary to those moments of crystalline joy encountered only near the edge of destruction. So when the next surfer is drowned under a sneaker set at Mavericks, the next skier pulverized by an avalanche in the Alps, or the next wingsuit pilot disintegrated against a granite face doing 130 mph down the side of a mountain, I won’t feign shock and anguish at the loss of another great soul. I only have so much empathy and there is not enough of it to spend on those who knowingly flirt with their own mortality. The spectacle of death, or the cheating of it, has become a valuable commodity in our society. It’s used to sell soda and energy drinks, endorse clothes, spice up news television shows and movies, market tourism and generally represent a life lived against the stultifying grain of modern white-collar ennui. It’s a trend that I find deeply troubling because it hijacks the complicated and nuance-filled culture of risk taking – at best morally ambiguous, at worst actively self destructive – and paints it in bright technicolor to be gobbled up by the masses. Before I worked on the sponsor side of the extreme sports industry, I assumed that a certain cynicism about the expendability of young bodies came with the job. I was surprised then, while at a position in a media house that lost some of its wingsuit pilots in accidents a few years ago, to see genuine outpourings of grief by my co-workers who had, in many cases, only known the pilots professionally. They felt a deep responsibility for having, in one way or another, endorsed the paychecks that allowed these men to do the very thing that eventually ended their lives. In short, they believed they had contributed to the deaths of people they cared about and respected. In a way we had. Modern extreme sport sponsors basically write blank checks to people who are often endowed with more guts than brains and then expect them to make up their own minds about what may or my not potentially kill them. As far as I’ve witnessed, there’s nothing overtly coercive in the relationship— pressuring an athlete to do something dangerous is bad for business. But then you don’t really have to; there’s always someone younger, hungrier, and more talented who will take an aging ambassador’s contract the second they can no longer win heats or grab magazine covers. As an athlete, a terrible onus hangs ever-present over your head to keep pushing, to stay on just the right side of the cutting edge because for all your status and acclaim, you’re only ever one injury away from complete professional obsolescence. It is the dominant irony of modern celebrity that those with the most prestige are simultaneously the most expendable. The main effect of this irony has been the development of a culture that pathologically, and at times cynically, turns a blind eye to grief, tragedy, and the maiming of young people. In selling millenials delusions of energy-drink grandeur the industry (in which we, the media are complicit) has created a zero-sum game of death or glory in which there is no room for sadness or second-guessing, no room for regret or even healthy analysis. It’s just hero worship and hagiography until your star is either dead or too busted up to keep dancing, then it’s on to the next one who is willing, and hopefully able, to take the game one step further. If you see enough death you begin to recognize the stock phrases that surround it, especially in cultures where eulogies are written by marketing departments. Our go-to has become “She died doing what she loved most”—as if this sort of fanatical samurai commitment is something we should all aspire to. The truth is that anyone who dies doing what they love has made at least a couple of grave mistakes, starting with falling so deeply in love with something that has a very high risk of ending their life prematurely. It’s hard to imagine that even the deceased would disagree: presumably, they would prefer to still be doing what they love instead of languishing under the ground being consumed by worms. They are, in most cases, also surrounded by people who would prefer them to still be alive – spouses, friends, co-workers, parents, siblings, and of course, children. The main argument against self-preservation is that athletes are dedicated to a higher cause, that their mortal lives pale in comparison to the moments achieved when risking them. Perhaps at certain, very high levels, this is true, but I have my doubts. If we put aside the fact that the premises of Corliss’ argument are wildly misjudged and misinterpreted (see navigation and mountaineering are vastly dissimilar) he’s right in that advancement requires certain risks. The problem is that Corliss and Honnold are both uncharacteristically vague about what “advancements” they are contributing to. 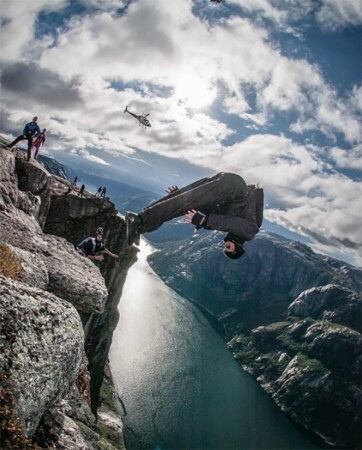 What greater good is promoted by the wingsuit flight? What cutting edge is Alex Honnold extending when he embarks on his next climb? What threshold is conquered every time the “biggest wave ever ridden” is increased by a foot or two? In Mountains of the Mind, the incomparable Robert McFarlane writes what is perhaps the definitive deconstruction of the heroic myth of dying in the mountains, or indeed doing any “extreme” activity. It includes an entire chapter, which as far as I can tell, is unique in the history of climbing literature in that it tells the story of the death of George Mallory on Everest through correspondences with his wife. In doing so, it recasts the 20th century’s canonical tale of heroism in the face of the unconquerable nature as the terrible folly of a man deluded into romanticizing his obsession with mountains and the prestige conferred by climbing them. In the end the reader feels neither admiration nor catharsis for the climber usually portrayed as one of outdoor culture’s greatest heroes, only pity—for his family, for his friends, and most of all for him. I understand as well as any, and perhaps better than most, the attraction of taking risks for the sake of the spiritual payoff when a goal is accomplished or a threshold conquered. In spite of this latent attraction, or perhaps because of it, I have come to believe that many of our best athletes are suffering from a sort of Mallory complex, a delusion that their lives are less meaningful if they aren’t being put to the test at high altitudes, high velocities, or in high surf. Their industries have come to support them in this delusion, innocently in most cases, but at times cynically— because gnarly sells so much better than pretty good. In the 21st century the rise of technology, the death of old gods, 24/7 media, and a planet that is slowly rising to a boil have left 6 million humans searching for something to believe in. Those of us who can find it outdoors are lucky on various levels so it’s important to ensure that our little cult of life doesn’t devolve into a spectacle of death in the name of a few marketing dollars and a bit of media recognition. There is nearly an infinite number of ways to enjoy the outdoors, each as valid as the last and all intensely personal. Playing chicken with your own mortality is but one of them; it just so happens to be the most commercially viable one and the one that is increasingly coming to define us, both in the media and perhaps in our own minds. Potter, Kelly, Daley, Foo, Chesser, Osmond, McConkey…the list goes on and on, perhaps all the way back to Mallory – all these men and women were worth more than carbonated sugar water and B movies; I hope, before the end, they realized that too.